Altocumulus perlucidus are clouds which form at the middle level, the height between 6,000 and 16,000 feet. They are termed middle level clouds due to the fact that most other clouds occur at levels much higher or much lower than this. Altocumulus perlucidus clouds are important for a number of reasons. For instance, the large amount of precipitation contained within the altocumulus perlucidus clouds means that they are very significant in aviation. Planes which fly directly into the altocumulus perlucidus clouds are at risk of having frost on the wings, which almost always causes mechanical problems. For this reason, most people involved in aviation are needed to know a thing or two about altocumulus perlucidus clouds. What height are altocumulus perlucidus clouds found? Altocumulus perlucidus clouds usually form at around 6,000 to 16,000 feet above sea level. How are altocumulus perlucidus clouds formed? Formation of altocumulus perlucidus generally follows the rules as regards formation of other cloud types. Typically for the altocumulus perlucidus clouds to form, a mass of air has to first of all gain some moisture content. This could be through evaporation when the sun heats up the ground, or it could be when the air mass flows over a water body, accumulating water as it skims over it. Whatever the method of gaining the water, one thing that has to happen is that the air, once it has gotten enough water in it, has to be pushed upward to the upper parts of the atmosphere. In this environment, the low temperatures cause the water droplets to condense, leading to formation of the cloud. Movement up a physical barrier such as a mountain, or when the land is gently sloping upwards such as from a beach to the interior. When the air mass meets a colder air mass, which forces it to ride over it. The air that has the moisture normally has less weight as it’s warmer, so this is easy. Simple convectional currents, whereby heat from the earth heats up the air above it, causing it to expand and become lighter. What do altocumulus perlucidus clouds look like? 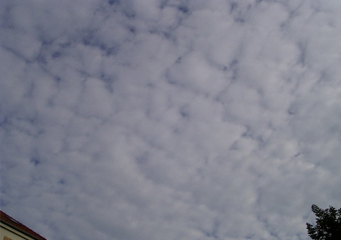 Altocumulus perlucidus normally form in lumps, and may resemble lumps of cotton wool in the sky. How common are altocumulus perlucidus clouds? Altocumulus perlucidus are one of the most common clouds to be formed, and you can easily spot them if you are in a temperate zone. However, the thing about these clouds is that they are very volatile; they form and dissipate very fast. You therefore need to be keen to spot them. Where can I see altocumulus perlucidus clouds? The general consensus is that altocumulus perlucidus clouds can mostly be seen in temperate zones.